Most of us have heard about the benefits of meditation – to reduce stress and anxiety, to boost creativity and productivity and improve health in general. You wish to meditate but don’t have time. Maybe you’ve tried to meditate but had some troubles such as finding a quiet place, connect with your feeling and focus your mind. 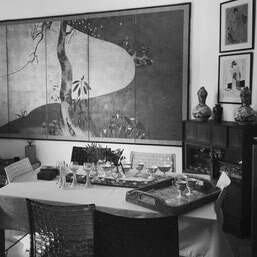 Azumi Uchitani, as a Japanese lifestyle and meditation coach, will introduce you a technique of Japanese calligraphic meditation. She combine the best of her certified skills as a Reiki therapist and NLP coach with her native Buddhism and Shinto practice. After years of her personal journey, she has formulated this method and she uses it as a tool to be present, live life with a flow. With this tool, we can "meditate" whenever you need to and wherever you are. 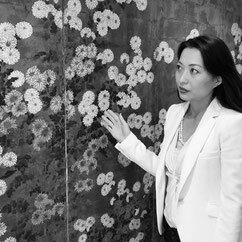 Azumi has given Calligraphy meditation session for many years, at museums, corporate, fashion & design events such as a fashion show of Marlies Dekker for the oriental theme. 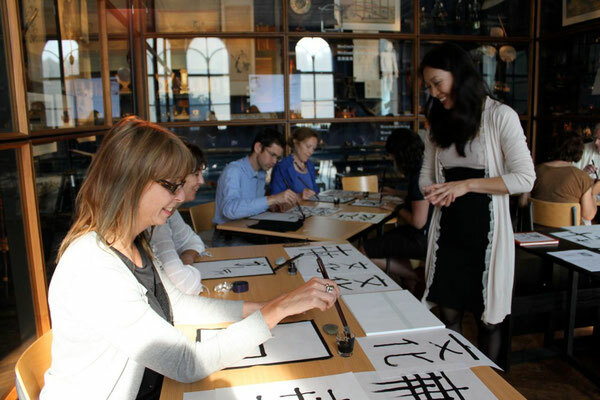 This workshop introduces beginners to the subtle art of brush stroke and the basic of Japanese characters (Kanji) - the symbol. 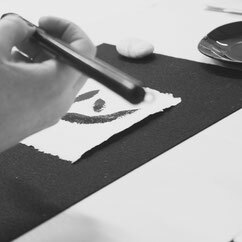 Ink, paper and brush are prepared for you at Japanese salon. Please join and feel free to explore the world of Japanese calligraphy. 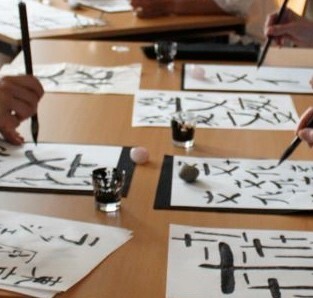 Japanese calligraphic meditation, as its name, is all about connecting body and soul, to find a channel through which you can listen to your inner voice, what your body want to tell you, to listen to your inner self just for a moment. You will be guided to make the symbol that represents your current energy and feeling, wildly exploring in an unconventional way. Bring your subconsciousness into consciousness. It’s all YOU. Your feelings will be demonstrated on papers with your stroke of brush. Your negative and positive emotions will come to surface and as you practice, you will encounter the stillness and ultimate bliss - authentic yourself. At this session, you will be given a Japanese delicate "fan" (see below) in which you will make the calligraphy. Weekly group session will start soon. Please sign up to receive the details.